Die Cablegate-Dokumente als E-Book bei… Amazon! Natürlich verkauft nicht Amazon selbst, sondern ein Drittanbieter das E-Book über die Plattform... aber irgendwie finde ich es einen coolen Hack, so die Daten wieder auf die Amazon-Server zu bringen. But can I buy it with PayPal? Hm, would Amazon let me buy this using my PayPal account? What about my Visa or Mastercard? 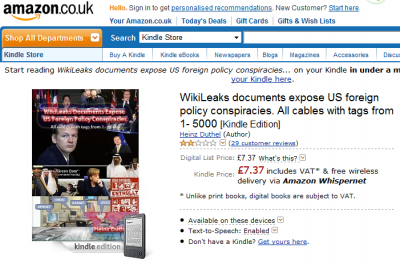 Considering all those companies stopped supporting Wikileaks, it would be pretty messed up if I could use them to pay Amazon. Wait a second... Why is this for sale on Amazon now? Didn't you guys, like, totally chicken out and dump Wikileaks from your servers because mighty Lieberman sneezed?